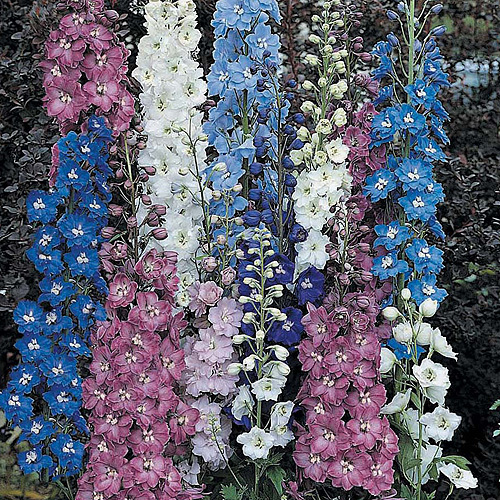 Tall, elegant spires in shades of blue, mauve, deep pink or white that have an stately presence in the border, always best in blues for my money though. 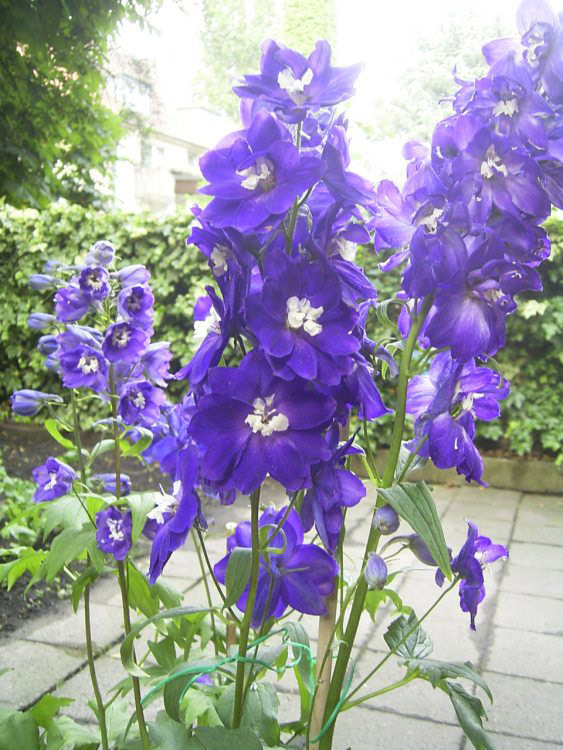 Perennial Delphiniums grow from ground level to 4-5ft each year, a classic and favourite cottage garden flower. 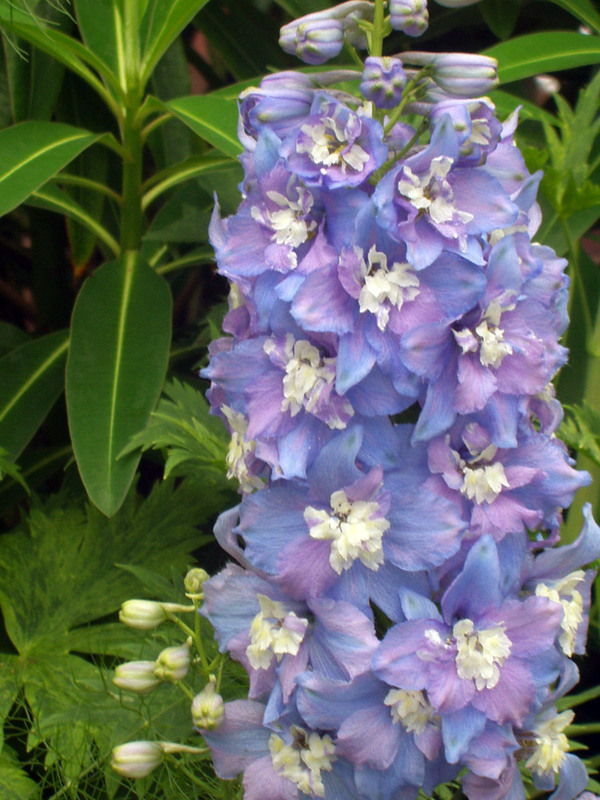 Along with Gentians and Himalayan Poppies, these are the archetypal blue flowers. 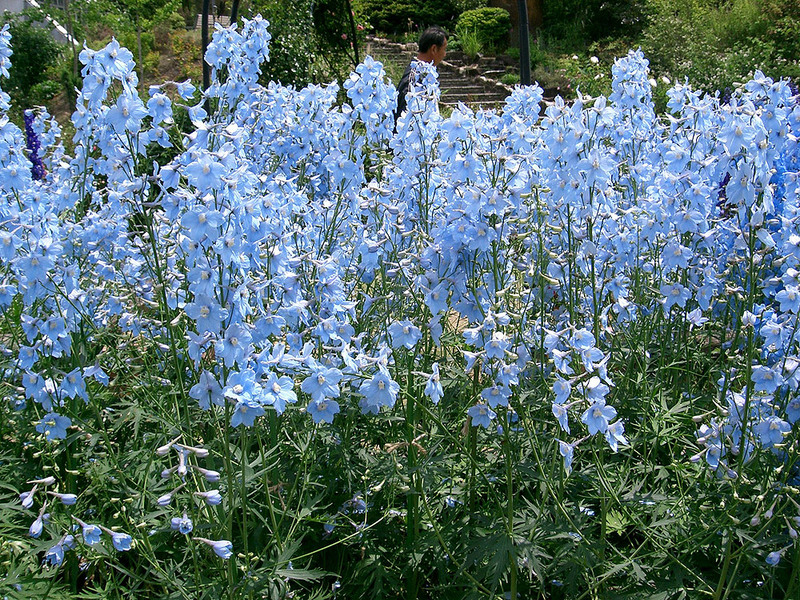 Tall upright plants with long flower spikes, may be perennials or some groups grown as annuals or biennials. Large lobed and toothed leaves up to 8" long and wide, flower spike (raceme) is often at least half the height of the whole plant and consists of several dozen individual flowers. 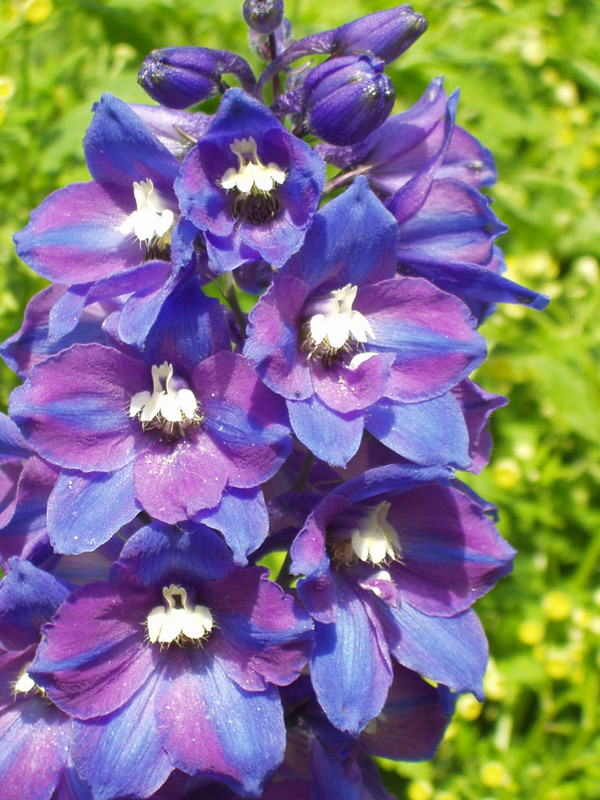 Annual Delphiniums are sometimes referred to as "Larkspur". 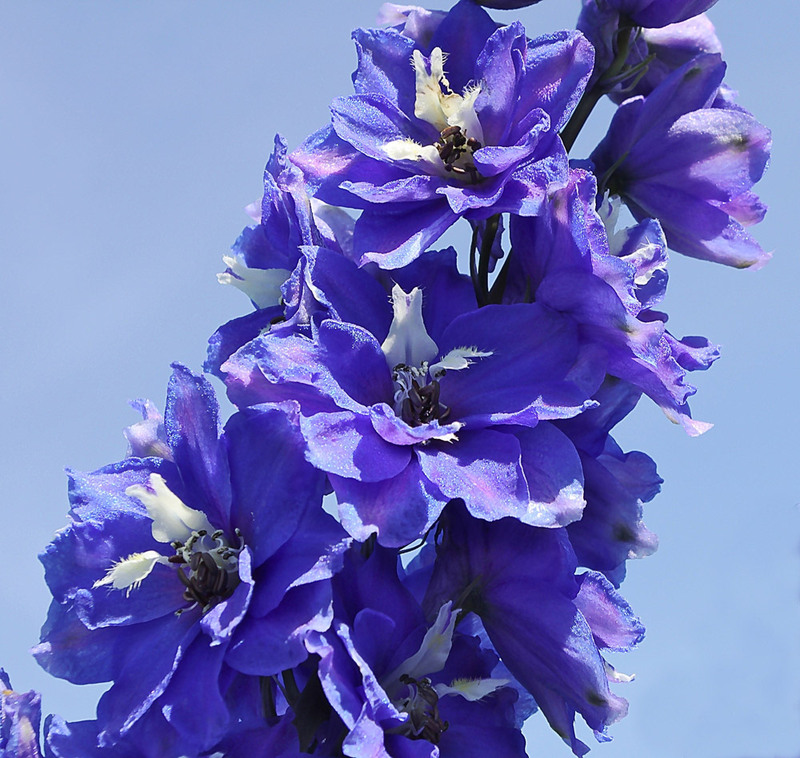 Flower colour: Classically in shades of blue, but also available in reds, pinks, pale yellows and even green (though some of us wonder why?). Flowers may be single or double. Garden care: Grow towards the back of a mixed border, stake with brushwood, inter-connecting plant supports or a circle of canes with string when they reach 30cm (12") in height, so they are supported but can grow through them and hide the support. 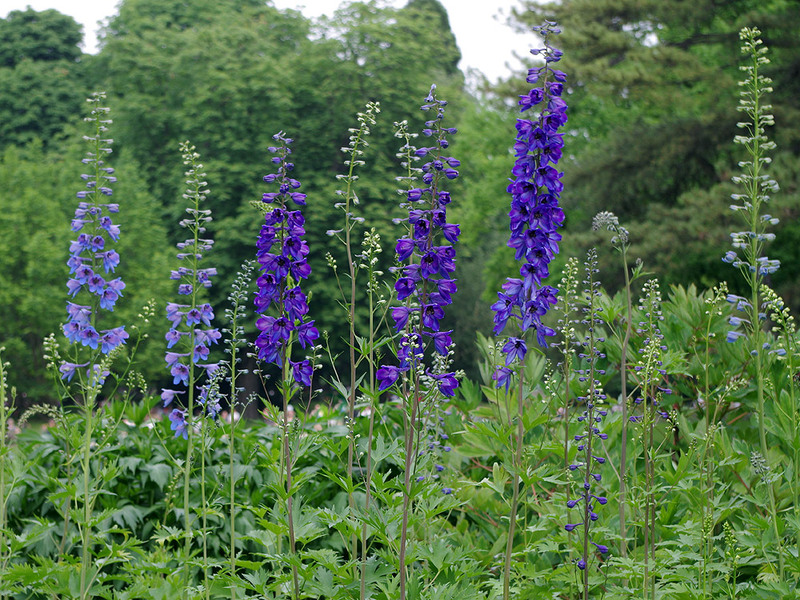 Taller specimens will need individual staking to support the heavy and spectacular flower spikes. Strongly growing plants benefit from liquid fertiliser. Particularly susceptible to slug damage in spring when emerging from the soil, this becomes less of a problem as the plants mature. Cut back after flowering to ground level leaving small emerging side-shoots, these may give a second flowering in the autumn, though not as tall as the early summer flowers. Cut back to just above ground level in the autumn when the leaves start to die down. 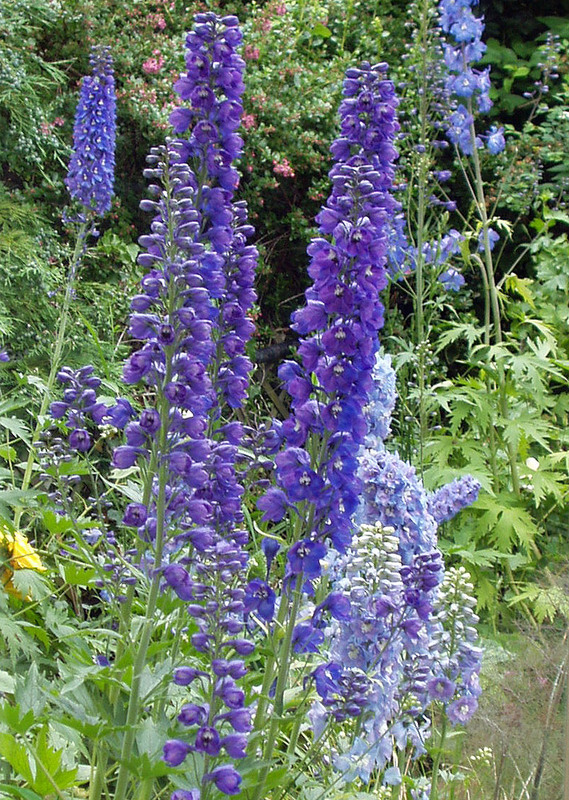 Generally easy to grow, staking or support is the real key to success as flopped-over flower spikes are disappointing. Photo credits: (numbering left to right top to bottom) 1-Paul Ward - angliangardener.co.uk / 2-Paul Ward - angliangardener.co.uk / 3-Paul Ward - angliangardener.co.uk / 4-Dinkum - Creative Commons Attribution 1.0 license. / 5-GFDL - Creative Commons Attribution 3.0 Unported license. / 6-JLPC - Creative Commons Attribution 3.0 Unported license. / 7-KENPEI - Creative Commons Attribution 3.0 Unported license.